I live still with my parents and have not neither the space nor the money to set up my workshop, so I have to be creative to make something. An essential tool in any workshop is the vice, used to grip stuff, crush stuff, push stuff into some other... I knew I needed one, but could not afford paying for a new or used one. Then, one day I found a car jack, and thought I could turn it into something useful. Before getting my hands dirty, a good planning/design is essential for everything. I thought of many designs, but I finally chose a woodworkers vice, mainly because I thought of it as more feasible with what I had. I would use the whole screw and nut from the car jack, (around 40 cm long) and, for the jaws, reuse the metal. The guides (1m 8mm steel tube) were cut to 45 cm, producing 10 cm of scrap. The handle was made with a 6mm metal rod. Improvement is in progress, ideas are welcome. x4 8mm bolts, many washers, and 4 wood screws. I also needed a 8mm and 12 mm wood drill bit, 8mm and 4mm metal drill bit. Then, cutting the pallet board. Drilling: Due to lack of tools and experience, I had to file A LOT for the screw and guides to fit and slide properly. Measure and plan carefully where are you going to put the guides, because, at least with this design, may things could go wrong. A drill press would have helped a lot here, as well, to drill everything at once so holes match. There are 3 holes in each jaw (wood) (12 mm for the spindle and x2 8mm for the guides), 4 holes in each angle iron (those that screw to the wood and those for attachment to the car jack), and in the end, for screwing to the bench (not yet) and for the guides (it serves as stopper). The guides are drilled as well (I first glued the washers to the tube with cold weld, but it did not work well, so I decided to use bolts as stoppers. Was a real challenge to drill 8mm. Filing: the longest part was to file a groove in the wood to make the "joint" of the car jack fit better and make a straight line. I made the handle with a 6mm rod, cold bent to fit in place. I know it looks crude, but it is fully functional. I believe the jack was abandoned because it lacked the handle, and I was too lazy to search for spares. Step 5: Does It Work? Of course it does. A whole new world opens before me. I realise I have made (I knew there were going to be) a number of mistakes; maybe someone else can spot even more , so feedback is appreciated. Thank you very much if you are reading this. Awesome idea. I have a couple of these "death trap" jacks laying around, and Welder and Drill press to make the project easier. I will me making some of these for my workbench. Thanks for the instructable. the same idea can be made without disassembeling the jack ,by removing the center rod and fixing then jack in its place ,it gets a little too bulky but this way you get to keep the jack . Where would the jaws go? How do you compensate for the jack structure angling? do you have a pic? Strange, jacks were run out of store.....kidding, nice 'ible! Over the years I've had to explain to a lot of people why, buying a chunk of all-thread big enough to make a vise was probably not a good idea. Now I have a place to send them for a much better idea. Nice instructable! A great idea to re-purpose those dangerous scissor jacks. I will have to find my old jack and try this! I also thought on making them at this time, but I believe I will wait until I need them. I am a bit worried about shear stresses; maybe it can be overcome with thicker dowels. What do you think? You are correct, wait until you need them, if ever. 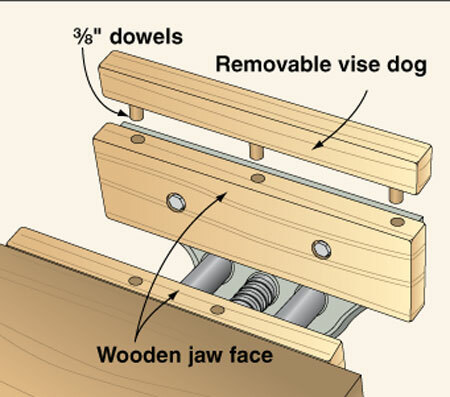 I use dowels from 3/4" [19mm] to 1"[25.4mm] diameter, or simply what I have on hand. Woah, cool project! But is the pressure even? I would need this device to clamp wood together to make cutting boards. Althought it might look uneven, the mobile jaw adapts to the piece you are working on as it is tightened. Wow. That would make a really powerful clamp.